FRACTAL CYPHER's New Music Video Reaches "From The Above And To The Stars"
Montreal prog quartet FRACTAL CYPHER are premiering their first single and music video "From The Above And To The Stars". The track is off the band's upcoming mini-album Prelude To An Impending Outcome, due out this coming November. Prelude To An Impending Outcome is a 4 song mini-album produced by Chris Donaldson (CRYPTOSY, THE AGONIST, BEYOND CREATION) that promises to be a roller coaster of genres across completely different sounding songs with intimate lyrics influenced by personal experiences. Each track has a different prominent genre influence from power ballad, blues, djent and jazz with the band’s heavy and melodic base as an anchor. The album artwork was done by Silent Q Design out of Montreal and foreshadows the moody and existential prog metal that lies within. 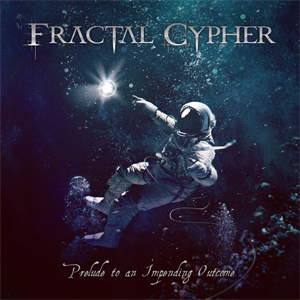 Although this album is more intimate with different textures and influences, the reception to its predecessor should be a prime indication of the talents of FRACTAL CYPHER; this next release is sure to be a masterwork. Prelude To An Impending Outcome is slated for self-release on November 8, 2018 and available for pre-order on the band's Bandcamp. "The Grandeur Of It All"
"From The Above And To The Stars"